I would say that despite the claim on the back of the book, this isn't so much an overturning of fairy tale history. It is a book based agrument. Bottigheimer points out several misconceptions that people have about literary rates, in particular in Germany. The points about tracing the Grimms back to Basile and Straparola, however, didn't feel knew. This could be because I've read essays by Bottigheimer as well as Jack Zipesthat show connections. This books just takes it a logical step further. I found myself wishing however, that the book was as bit longer. Bottigheimer almost seems to stop when she gets going. She traces fairy tales back to Lionbruno, a 1470 story. The story is similar to Arthurian romances by Marie de France and de Troyes Chretien. Considering Anderson's Fairytale in the Ancient World, I would've liked more discussion towards the end.Bottigheimer's book is worth reading for her insightful comments about Straparola, in particular his inventing of the povertry to magic to marriage to wealth plotline; as well as her comments about the Grimms. I got into fairy tale scholarship as part of my pursuit of what went into the making of the modern fantasy genre. The author defines fairy tales as either stories about the poor who obtain wealth/marriage through magic ("rise fairy tales") or stories about royalty who are somehow knocked down, experience various trials, and then regain status similar to their former position ("restoration fairy tales"). She asserts that when so defined, fairy tales do not have their roots in oral tradition the way that folk tales do. Historically, folklore scholars have thought that fairy tale writers like Straparola, Perrault, and the Brothers Grimm collected fairy tales from people to whom they had been passed down in an oral tradition since time immemorial. Bottingheimer, however, makes a convincing argument that these fairy tales originated in the literary traditions of urban Italy, were borrowed and changed by the French, and borrowed yet again by the Brothers Grimm and other writers across Europe. One of the reasons why this idea has encountered ridicule and resistance in the past is partially because all of the Brothers Grimm's tales (both folk and fairy tales) have been a source of national pride for Germany, so no one wanted to admit that the fairy tales could have come from a foreign source, even though their fairy tales share obvious elements with those of Perrault and other writers. Instead, scholars have touted the idea that all of these writers somehow got their stories from the same mysterious "folk" who don't seem to have any basis in historical reality. This is a short but powerful little book. Though probably not long or detailed enough to totally revolutionize fairy tale history in the way Bottigheimer is hoping, she nevertheless makes a convincing argument against the popular conception of fairy tales as springing from anonymous folk origins. Working backwards from the Grimms (Germany) to Perrault & Leprince (France) to the first written fairy tales in Italy (Basile & Straparola), Bottigheimer shows how the traditional divide between oral/pure/genuine fairy tale and the written/literary fairy tale is a false one. In fact, she argues, the fairy tale as we understand it is an almost purely literary creation, and has become falsely conflated with the oral folk tale through misrepresentation (I'm looking at you, Wilhelm Grimm) and pure accident and misunderstanding by generations of scholars. None of this really tells us anything about why fairy tales are popular or, as Jack Zipes puts it, "why they stick," but it's a useful reminder not to take everything the Grimms say as gospel. First academic-y read in a while, and what fun! If you've ever noticed from the books I read, I'm a bit of a fairy tale nut, and every now and again, I like to read something about their origins. 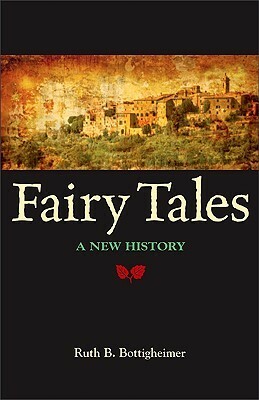 Fairy Tales: A New History deconstructs the argument of the modern "fairy tale" as stories that came out of an oral folk history, but rather as layered constructions of texts from Italian (Basile and Straparola) to French (Perrault and Lheritier) to German (Grimm). I have a basic knowledge of folk- and fairy-tales, and enjoyed the opportunity to look deeper into the history. Every new author who retells a fairy tale lends their own experiences, culture, and propaganda, whether to praise the goodness of human nature or revile in the banality of the same. This is my first completed book of the 2016 Modern Mrs. Darcy Reading Challenge: a book recommended by a local librarian. Or in this case, a librarian-in-training, as a part of a reference interview school project. Although this book brings up some interesting points, I could use it as a "what not to do" model. It could teach simple lessons, like build your argument on logic and evidence instead of overuse of words like "obviously," clearly," "conclusively," "definitively," and so forth. Stating that it's obvious doesn't make it obvious. If you want to sell me on it, build a sound argument. Also, build your argument on a body of research, not just on your own previously published works. It just looks silly when you flip to the endnotes to see her cite herself time after time. This book has a lot of conjecture, unsupported argument, and overly aggressive language. I was not impressed. Definitely one for the academics, not for the casual reader with an interest in Fairy Tales. This wasn't quite what I was looking for, but I enjoyed it anyway. I knew little about the origins of fairy tales and enjoyed learning about these alternate histories--the more common oral history and the one Bottigheimer proposes, which gave me flashbacks to Imagined Communities. Not being familiar with this area of scholarship I can't comment on how widespread either theory is, but certainly the book implies she's a lone wolf, which always makes me a little suspect. As does the combative tone of the book. I was taught in grad school to keep the scope of a paper as tight as possible and the tone as balanced as possible; here Bottigheimer covers a lot of ground in very few pages and, as another reviewer has mentioned, peppers those pages with words like "obviously." It was hard to separate what was supposed to be "obvious" with what Bottigheimer admitted was impossible to know due to loss of historical record, which left the reader with the impression that her theory would be obvious, if only there was enough records left to justify it at every historical stage.Still. It was interesting, and for me a gentle way to start using the lit crit portion of my brain again (it's been some time!) It left my appetite whetted for more, and hopeful that my own line of research will be ultimately fulfilled--I am interested in the origins and mechanisms of what Bottigheimer calls "fairyland" stories, stories where a complete alternate world is projected. It was a little irritating that they were dismissed as a 16th/17th century fad. I would have liked to see a little more discussion of them, as well as more observations on how medieval romances played a part in the emergence of fairy tales.Two bits that jumped out at me and then I'll shut up: there is a line on page 98 about types of characters who "embody raw wickedness", and then every type listed is female--huh? And on 113: " . . . literate authors who are city-oriented people like ourselves." That would have gotten me a big slap on the wrist in my school days. Just sayin'. I obviously need to read more fairy tale lit crit.I think by now, everyone knows that the Grimms' main source of stories was a middle class peer and not the country folk he later claimed. But I was still under the impression that those middle class sources had received their stories via oral transmission. Bottigheimer makes an extremely persuasive argument that the creation and transmission of these fairy tales (not the folk tales, but the rags-to riches stories of princes and queens) has always been literary.Her arguments were very interesting, and I'm going to have to check out some of the sources she referenced.One quibble of the book is that Bottigheimer spends significant time on debunking the idea of stories passing word for word, unchanged through history. I have studied folklore a bit, so when she started talking about "uncontaminated" sources, I assumed that she meant that the transcriber only transcribed- that he didn't change the wording of the stories or alter them in any way. And that the original sources for the story were other stories rather than popular media. Yet, Bottigheimer uses "uncontaminated" to mean that the stories have remained unaltered in any fashion, word-for-word the same for hundreds of years. The Grimms and his contemporaries may have said such a thing, but has anyone in recent history actually believed this? Just the sheer number of variations on every tale imaginable makes that an irrational argument. Ruth B. Bottigheimer, Fairy Tales: A New History (2009)Suggests that the Brothers Grimm got punked by their sources. That far from finding rich treasure troves of Germanic oral folk literature, they found people willing to retell stories out of story books, mostly French. So instead of stories retold for centuries because they spoke to the real or felt needs of a people, they are really stories that got published and were in books owned by the people the Grimms talked to. Heresy! I’m not enough of a folklorist to even begin to judge this, and the book is a little thin on justifying the hypothesis. But it does provide an explanation for something that never made too much sense to me – why are so many of these stories about marrying princess and princes? Maybe because the people buying the books were of a social class that was to some extent both tilting against and long to be the Old Orders. Which suggests that the folkloric wisdom of the fairy tales are a little thinner than Bettelheim, et al, believed. Also brings up Hitler. This book goes through the history of storytelling starting from the Grimm Brothers, working to France with Perrault and Mme d'Aulnoy. Then it goes to Italy to study Giambattista Basile and Giovanni Boccaccio. It does a really good job of methodically describing the origins of the fairy tales throughout Europe. It also mentions the "Ocean of Story" idea that all stories have one source (not unlike "Q Source" for the gospels). Measured and methodical, with some diagrams describing a "rise" vs. "restoration" fairy tale. I don't know if I agree with her argument, but it was a quick, fun read. Bottigheimer's thesis is that most of our familiar tales began their lives not as oral tales but as literary ones, and passed from there into the oral tradition. She focuses particularly on the "rise" tale and makes connections between the popularity of that tale type and the rise of the middle class. While her research is impeccable and her analysis is interesting, I just can't fully buy the argument--particularly when at least one of her "rise" tales ("Cinderella") can so easily be seen as a "restoration" tale instead. Still, it's provocative and worth reading. Bottigheimer convincingly argues that fairy tales were not taken from some obscure oral folk tradition, but began their existence in the written form in the sixteenth century. Not my favorite-- it was interesting information, but the it wasn't a dramatic revelation like the author seemed to think it was. A bit dry and I'm not too sure about some of the points made, but fairly interesting and a different perspective. Ruth B. Bottigheimer - Ruth B. Bottigheimer, is a Research Professor in the Department of Comparative Literary and Cultural Studies at Stony Brook University, State University of New York, is a leading historian of European fairy tales. Her conclusion that the most popular modern fairy tale plot originated in Renaissance Venice has been hotly contested and occasioned the October 2010 issue of the Journal of American Folklore. Her publications include Fairy Tales: A New History (2009), Gender and Story in South India, ed. with Lalita Handoo and Leela Prasad (2007), and Fairy Godfather: Straparola, Venice, and the Fairy Tale Tradition (2002). Past publications include The Bible for Children: From the Age of Gutenberg to the Present (1996), Grimm’s Bad Girls and Bold Boys: The Moral and Social Vision of the Tales (1987), and Fairy Tales and Society: Illusion, Allusion and Paradigm, ed. (1987), as well as articles on European fairy tales, the history of illustration, and the socialisation of children through Bible narratives. She also reviews widely, has contributed numerous encyclopaedia articles, and has translated many scholarly articles into English.She is a Life Fellow of Clare Hall, Cambridge, held a seven-year visiting fellowship at Magdalen College Oxford 1997-2004), and has taught at Princeton University, Hollins University, and the Universities of Innsbruck, Göttingen, Siegen, and Vienna. An active member of professional organisations in the fields of folk narrative and children’s literature, she also serves on the editorial boards of scholarly journals in her fields and is continuing research in the history of early British children’s literature and the overall history of fairy tales in Europe and in nineteenth- and twentieth-century overseas colonies.Ongoing research includes shifting relationships between magic and heroes and heroines in tales of the fantastic from ancient Egypt to the Renaissance, fairy tale authors’ prefaces to and comments on their own works (from the Renaissance to the nineteenth century), and the literary basis of fairy tales that have become so widely known that they are routinely used in film, commerce, and literature, as well as told by ordinary people.